Thread: Hello - The Palette! We’ve seen 3D printers become easier to use, more affordable, and more accessible; but the range of objects they can create has remained the same. No one has taken these printers to the next level... until now. The Palette lets you build an unprecedented range of creations on the 3D printer you already own. The ability to print with up to four colours, or materials with different properties, lets your printer move beyond creating simple, single colour plastic objects. Bring your printer into the future with The Palette. The Palette was designed from the ground up for the 3D printing community, it was engineered with simplicity in mind. 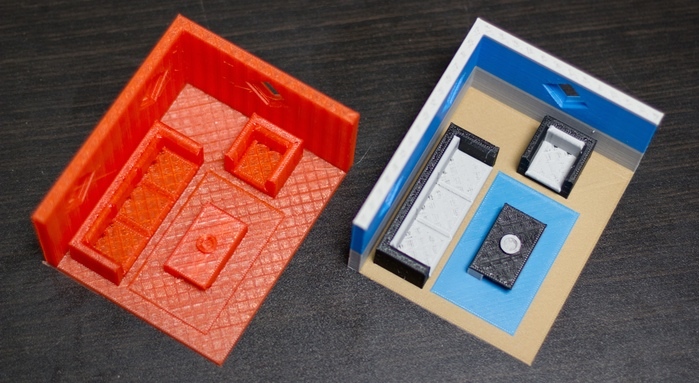 If you can use a 3D printer, you can build high quality colour creations with The Palette. You can skip the upgrade cycle of buying an expensive printer, keep using your favourite slicer, and use whatever filament supplier you want! 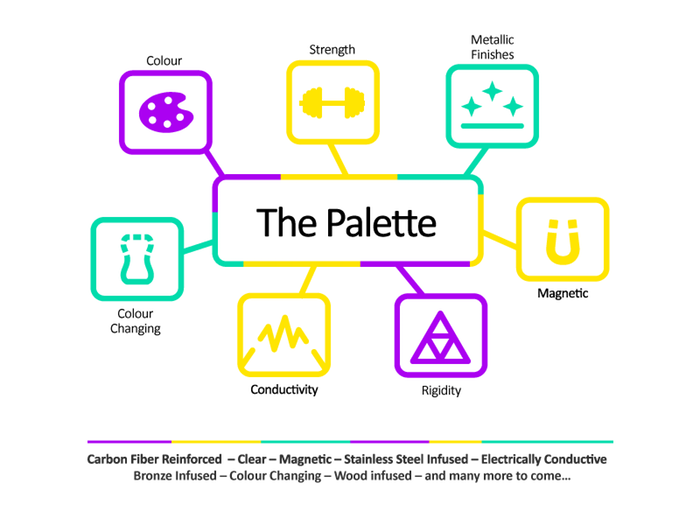 The Palette isn’t limited to colour; you can add in many of today’s exotic filaments, like Conductive, Carbon Fiber Infused, Stainless Steel Infused and Woodfill, just to name a few. 3D printing is about the communication of ideas. This communication is restricted by the single colour limitation our machines are faced with today. Removing this single colour limitation lets you increase the communication potential of your printer, and lets you truly bring your imagination into the three dimensional world. FDM 3D printers run off of plastic filament, the colour of your filament determines the colour of your object. The Palette takes in four filament inputs and combines them together into a single filament output! Everything is done automatically, from the order of the filaments, to their exact length, to make sure every colour shows up exactly where it should! All you have to do is go through the simple setup sequence and print like you normally would! If your printer uses open 1.75mm filament, has access to the filament feed, and runs on .gcode or .x3g then you can unleash it's true potential with The Palette. 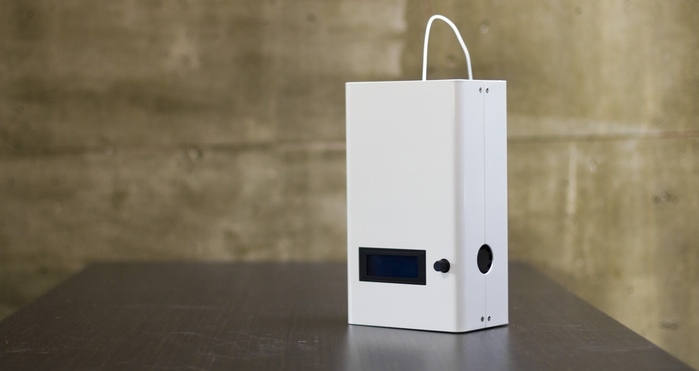 The Palette requires no modifications, wiring, or hardware changes to your printer. Because of this, it's compatible with a wide range of printers! Check out the F.A.Q. for full details on compatibility, as well as how you can test your printer! The Palette lets you continue to use your favourite modeling and slicer programs! You then run the output through our application. Our app gives you the modified .gcode/.x3g file for your printer and the .SEEM file for The Palette! Bonus: If you use Cura, you can process using our plugin! You put the .gcode/.x3g file onto your printer, the .SEEM file onto your Palette, and hit print! We're open sourcing all of our software and firmware so you can add in any features you'd like to see! Printing isn't a perfect science, so we created a feedback loop to ensure The Palette and your printer are always on the same page. Mosaic's app inputs a series of checkpoints into the .gcode/.x3g file. 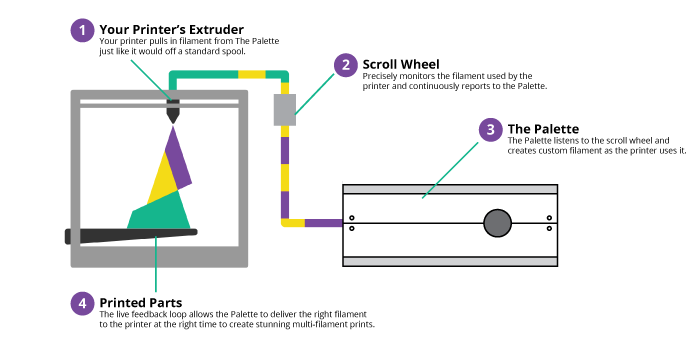 The Palette reads these checkpoints, and if the buffer is shifting, the Palette makes adjustments to the upcoming lengths of filament to ensure every piece of filament goes back to being perfectly synced! "Printing isn't a perfect science, so we created a feedback loop to ensure The Palette and your printer are always on the same page. Mosaic's app inputs a series of checkpoints into the .gcode/.x3g file. "